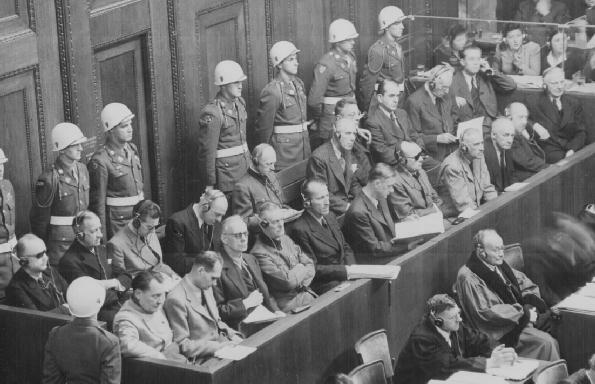 The former leaders of Hitler's Third Reich on trial in Nuremberg, Germany. Count 1 - CONSPIRACY to commit crimes alleged in the next three counts. Count 2 - CRIMES AGAINST PEACE including planning, preparing, starting, or waging aggressive war. Count 3 - WAR CRIMES including violations of laws or customs of war. Count 4 - CRIMES AGAINST HUMANITY including murder, extermination, enslavement, persecution on political or racial grounds, involuntary deportment, and inhumane acts against civilian populations. The majority of the defendants claimed they were unknowing pawns of Adolf Hitler or were simply following orders. Evidence used against the defendants included Nazi propaganda films and extensive Nazi paperwork documenting mass murder and other crimes. Also shown were films taken by the Allies after the liberation of extermination camps. Evidence in the court room included the shrunken head of a concentration camp inmate and tattooed human skin from concentration camp inmates used to make lampshades and other household articles. Hermann Göring - Considered to be the number two man in Nazi Germany after Hitler, Göring waged a vigorous defense on his own behalf. Guilty on all 4 counts. Sentenced to death by hanging, but committed suicide by swallowing poison on October 16, 1946 just two hours before his scheduled hanging. EXTRACT of the Judgment against Göring as it was pronounced. "From the moment he joined the Party in 1922 and took command of the street fighting organization, the SA, Göring was the adviser, the active agent of Hitler and one of the prime leaders of the Nazi movement. As Hitler's political deputy he was largely instrumental in bringing the National Socialists to power in 1933, and was charged with consolidating this power and expanding German armed might. He developed the Gestapo and created the first concentration camps, relinquishing them to Himmler 1934; conducted the Röhm purge in that year and engineered the sordid proceedings which resulted in the removal of von Blomberg and von Fritsch from the army... In the Austrian Anschluss he was, indeed, the central figure, the ringleader... The night before the invasion of Czechoslovakia and the absorption of Bohemia and Moravia, at a conference with Hitler and President Hacha he threatened to bomb Prague if Hacha did not submit... He commanded the Luftwaffe in the attack on Poland and throughout the aggressive wars which followed... The record is filled with Göring's admissions of his complicity in the use of slave labor... He made plans for the spoliation of Soviet territory long before the war on the Soviet Union... Göring persecuted the Jews, particularly after the November, 1938, riots and not only in Germany, where be raised the billion-mark fine as stated elsewhere, but in the conquered territories as well. His own utterances, then and in his testimony, show his interest was primarily economic-how to get their property and how to force them out of the economic life of Europe. ...Although their extermination was in Himmler's hands, Göring was far from disinterested or inactive despite his protestations from the witness box... There is nothing to be said in mitigation... His guilt is unique in its enormity. The record discloses no excuses for this man." Rudolf Hess - Formerly the number three man in Hitler's Germany until his flight to England on May 10, 1941, in which he attempted to negotiate peace with the British, who promptly imprisoned him for the duration of the war. Found guilty on counts 1 and 2. Sentenced to life imprisonment. Hess was the sole surviving Nazi in Spandau prison until 1987 when he committed suicide at age 92. EXTRACT of the Judgment against Hess as it was pronounced. "... As deputy to the Führer, Hess was the top man in the Nazi Party with responsibility for handling all Party matters and authority to make decisions in Hitler's name on all questions of Party leadership... Hess was an informed and willing participant in German aggression against Austria, Czechoslovakia, and Poland... On September 27, 1938, at the time of the Munich crisis, he arranged with Keitel to carry out the instructions of Hitler to make the machinery of the Nazi Party available for a secret mobilization... With him on his flight to England, Hess carried certain peace proposals which he alleged Hitler was prepared to accept. It is significant to note that this flight took place only 10 days after the date on which Hitler fixed the time for attacking the Soviet Union... That Hess acts in an abnormal manner, suffers from loss of memory, and has mentally deteriorated during this trial, may be true. But there is nothing to show that he does not realize the nature of the charges against him, or is incapable of defending himself... There is no suggestion that Hess was not completely sane when the acts charged against him were committed." Joachim von Ribbentrop - Nazi Minister of Foreign Affairs from 1938 to 1945, who signed the Nazi-Soviet non-aggression Pact of 1939 that paved the way for Hitler to attack Poland. Ribbentrop later involved himself in the Final Solution by pressuring the Italian, Bulgarian, Hungarian and Danish governments to evacuate Jews. Found guilty on all four counts. Sentenced to death by hanging. EXTRACT of the Judgment against Ribbentrop as it was pronounced. "Ribbentrop was not present at the Hossbach Conference held on November 5, 1937 (at which Hitler revealed his war plans), but on January 2, 1938, while Ambassador to England, he sent a memorandum to Hitler indicating his opinion that a change in the status quo in the East in the German sense could only be carried out by force and suggesting methods to prevent England and France from intervening in a European war fought to bring about such a change... Ribbentrop participated in the aggressive plans against Czechoslovakia. Beginning in March 1938, he was in close touch with the Sudeten German Party and gave them instructions which had the effect of keeping the Sudeten German question a live issue which might serve as an excuse for the attack which Germany was planning against Czechoslovakia... After the Munich Pact he continued to bring diplomatic pressure with the object of occupying the remainder of Czechoslovakia... Ribbentrop played a particularly significant role in the diplomatic activity which led up to the attack on Poland. He participated in a conference held on August 12, 1939, for the purpose of obtaining Italian support if the attack should lead to a general European war. Ribbentrop discussed the German demands with respect to Danzig and the Polish Corridor with the British Ambassador in the period from August 25 to August 30, 1939, when he knew that the German plans to attack Poland had merely been temporarily postponed in an attempt to induce the British to abandon their guarantee to the Poles... He played an important part in Hitler's 'Final Solution' of the Jewish question. In September, 1942, be ordered the German diplomatic representatives accredited to various satellites to hasten the deportation of the Jews to the East... Ribbentrop participated in all the Nazi aggressions from the occupation of Austria to the invasion of the Soviet Union... It was because Hitler's policy and plans coincided with his own ideas that Ribbentrop served him so willingly to the end." Wilhelm Keitel - General Field Marshal and Chief of Staff of the German High Command of the Armed Forces who condoned mass murder by the SS. Keitel also issued orders regarding the Night and Fog (Nacht und Nebel) decree. Found guilty on all four counts and sentenced to death by hanging. EXTRACT of the Judgment against Keitel as it was pronounced. "...Keitel was present on May 23, 1939, when Hitler announced his decision 'to attack Poland at the first suitable opportunity.' Already he had signed the directive requiring the Wehrmacht to submit its 'Fall Weiss' timetable (for the attack on Poland) to OKW (Oberkommando Der Wehrmacht - Armed Forces High Command) on May 1... Hitler had said, on May 23, 1939, that he would ignore the neutrality of Belgium and the Netherlands, and Keitel signed orders for the attacks on October 15, November 20, and November 28, 1939... Keitel testified that be opposed the invasion of the Soviet Union for military reasons, and also because it would constitute a violation of the Non-Aggression Pact. Nevertheless, he initialed 'Case Barbarossa' (for the attack on Russia) signed by Hitler on December 18, 1940, and attended the OKW discussion with Hitler on February 3, 1941.. On Aug. 4, 1942, Keitel issued a directive that paratroopers were to be turned over to the SD. On September 16, 1941, Keitel ordered that attacks on soldiers in the East should be met by putting to death 50 to 100 Communists for one German soldier, with the comment that human life was less than nothing in the East... Superior orders, even to a soldier, cannot be considered in mitigation where crimes as shocking and extensive have been committed consciously, ruthlessly." Ernst Kaltenbrunner - Successor in 1943 to Heydrich in the SS organization, in charge of the Reich Main Security Office (RSHA) with responsibilities including the Gestapo and the systematic evacuation of Jews to extermination camps. Found guilty on counts 3 and 4. Sentenced to death by hanging. EXTRACT of the Judgment against Kaltenbrunner as it was pronounced. "...When he became Chief of the Security Police and SD and head of the RSHA on January 30, 1943, Kaltenbrunner took charge of an organization which included the main offices of the Gestapo, the SD and the Criminal Police... During the period in which Kaltenbrunner was head of the RSHA, it was engaged in a widespread program of War Crimes and Crimes Against Humanity. These crimes included the mistreatment and murder of prisoners of war. Jews, commissars, and others who were thought to be ideologically hostile to the Nazi regime were reported to the RSHA, which had them transferred to a concentration camp and murdered... The order for the execution of commando troops was extended by the Gestapo to include parachutists while Kaltenbrunner was Chief of the RSHA. An order signed by Kaltenbrunner instructed the police not to interfere with attacks on bailed out Allied fliers... The RSHA played a leading part in the 'Final Solution' of the Jewish question by the extermination of the Jews. A special section under the Amt IV of the RSHA was established to supervise this program. Under its direction approximately 6 million Jews were murdered, of which 2 million were killed by the Einsatzgruppen and other units of the Security Police. Kaltenbrunner had been informed of the activities of these Einsatzgruppen when be was a Higher SS and Police leader, and they continued to function after he had become Chief of the RSHA. The murder of a approximately 4 million Jews in concentration camps...was also under the supervision of the RSHA when Kaltenbrunner was bead of that organization..."
Alfred Rosenberg - Nazi Party racial 'philosopher,' appointed Minister of the Eastern Occupied Territories in 1941, who aided Göring and Hitler in plundering art treasures. Found guilty on all four counts and sentenced to death by hanging. EXTRACT of the Judgment against Rosenberg as it was pronounced. "... Recognized as the Party's ideologist, he developed and spread Nazi doctrines in the newspapers Völkischer Beobachter and NS Monatshefte, which he edited, and in the numerous books he wrote... As head of the APA (Aussenpolitisches Amt - the Nazi foreign policy office), Rosenberg was in charge of an organization whose agents were active in Nazi intrigue in all parts of the world. His own reports, for example, claim that the APA was largely responsible for Rumania's joining the Axis. As head of the APA, he played an important part in the preparation and planning of the attack on Norway. Rosenberg bears a major responsibility for the formulation and execution of occupation policies in the Occupied Eastern Territories. He was informed by Hitler on April 2, 1941, of the coming attack against the Soviet Union, and he agreed to help in the capacity of 'Political Adviser' ... On July 17, 1941, Hitler appointed Rosenberg Reich Minister for the Eastern Occupied Territories, and publicly charged him with responsibility for civil administration... He helped to formulate the policies of Germanization, exploitation, forced labor, extermination of Jews and opponents of Nazi rule, and be set up an administration which carried them out... Rosenberg had knowledge of the brutal treatment and terror to which the Eastern people were subjected. He directed that the Hague Rules of Land Warfare were not applicable in the Occupied Eastern Territories. He had knowledge of and took an active part in stripping the Eastern Territories of raw materials and foodstuffs, which were all sent to Germany. He stated that feeding the German people was first on the list of claims on the East, and the Soviet people would suffer thereby. His directives provided for the segregation of Jews, ultimately in Ghettos. His subordinates engaged in mass killings of Jews, and his civil administrators considered that cleansing the Eastern Occupied Territories of Jews was necessary... He gave his civil administrators quotas of laborers to be sent to the Reich, which had to be met by whatever means necessary. His signature of approval appears on the order of June 14, 1941, for the Heu Aktion, the apprehension of 40,000 to 50,000 youths, aged 10-14, for shipment to the Reich..."
Hans Frank - Nazi lawyer and Gauleiter of occupied Poland who stated in 1941 "I ask nothing of the Jews except that they should disappear." Amid the ruthless extermination of Poland's Jews, Frank earned the nickname the "Jew Butcher of Cracow." Under his rule, the nation of Poland disappeared as a national entity and became a slave state, with the murder of Poland's leaders, educated elite and clergy, and the extermination of nearly all Poland's Jews. At the Nuremberg trial he declared "... a thousand years will pass and the guilt of Germany will not be erased." Found guilty on counts 3 and 4. Sentenced to death by hanging. EXTRACT of the Judgment against Frank as it was pronounced. "... Frank was appointed Chief Civil Administration Officer for occupied Polish territory and, on October 12, 1939, was made Governor-General of the occupied Polish territory. On October 3, 1939, he described the policy which he intended to put into effect by stating: 'Poland shall be treated like a colony; the Poles will become the slaves of the Greater German World Empire.' The evidence establishes that this occupation policy was based on the complete destruction of Poland as a national entity, and a ruthless exploitation of its human and economic resources for the German war effort... Frank was a willing and knowing participant in the use of terrorism in Poland; in the economic exploitation of Poland in a way which led to the death by starvation of a large number of people; in the deportation to Germany as slave laborers of over a million Poles; and in a program involving the murder of at least 3 million Jews." Wilhelm Frick - Nazi Minister of the Interior from 1933 to 1943, who originated the Nuremberg Race Laws of 1935 which deprived German Jews of their rights as citizens. Found guilty on counts 2, 3 and 4. Sentenced to death by hanging. EXTRACT of the Judgment against Frick as it was pronounced. "...An avid Nazi, Frick was largely responsible for bringing the German nation under the complete control of the NSDAP... The numerous laws he drafted, signed, and administered abolished all opposition parties and prepared the way for the Gestapo and their concentration camps to extinguish all individual opposition. He was largely responsible for the legislation which suppressed the Trade Unions, the Church, the Jews. He performed this task with ruthless efficiency... Always rabidly anti-Semitic, Frick drafted, signed, and administered many laws destined to eliminate Jews from German life and economy. His work formed the basis of the Nuremberg Decrees, and he was active in enforcing them... He bad knowledge that insane, sick and aged people, 'useless eaters.' were being systematically put to death. Complaints of these murders reached him, but he did nothing to stop them..."
Julius Streicher - Gauleiter of the section of Germany known as Franconia with headquarters in Nuremberg. Streicher was a notorious anti-Semite who published a popular semi-pornographic anti-Semitic paper, Der Stürmer, which advocated violent persecution of the Jews. Found guilty on count 4 and sentenced to death by hanging. EXTRACT of the Judgment against Streicher as it was pronounced. "...For his 25 years of speaking, writing, and preaching hatred of the Jews, Streicher was widely known as 'Jew-Baiter Number One.' In his speeches and articles, week after week, month after month, he infected the German mind with the virus of anti-Semitism, and incited the German people to active persecution... Streicher had charge of the Jewish boycott of April 1, 1933. He advocated the Nuremberg Decrees of 1935. He was responsible for the demolition on August 10, 1938, of the synagogue in Nuremberg. And on November 10, 1938, he spoke publicly in support of the Jewish pogroms which were taking place at that time. But it was not only in Germany that this defendant advocated his doctrines. As early as 1938 he began to call for the annihilation of the Jewish race... With knowledge of the extermination of the Jews in the Occupied Eastern Territories, this defendant continued to write and publish his propaganda of death... Streicher's incitement to murder and extermination at the time when Jews in the East were being killed under the most horrible conditions clearly constitutes persecution on political and racial grounds in connection with war crimes, as defined by the Charter, and constitutes a crime against humanity." Walther Funk - Minister of Economic Affairs from 1937 to 1945, Funk headed the Reichsbank which received gold, jewels, and other valuables taken by Himmler's SS from Jews destined for extermination. Found guilty on counts 2, 3, and 4. Sentenced to life imprisonment, Funk was released in 1957 for health reasons and died in 1960. EXTRACT of the Judgment against Funk as it was pronounced. "...Funk became active in the economic field after the Nazi plans to wage aggressive war bad been clearly defined... On October 14, 1939, after the war had begun, Funk made a speech in which he stated that the economic and financial departments of Germany working under the Four Year Plan had been engaged in the secret economic preparation for war for over a year... In 1942 Funk entered into an agreement with Himmler under which the Reichsbank was to receive certain gold and jewels and currency from the SS and instructed his subordinates, who were to work out the details, not to ask too many questions. As a result of this agreement the SS sent to the Reichsbank the personal belongings taken from the victims who bad been exterminated in the concentration camps. The Reichsbank kept the coins and banknotes and sent the jewels, watches, and personal belongings to Berlin Municipal Pawn Shops. The gold from the eye-glasses and gold teeth and fillings was stored in the Reichsbank vaults. Funk has protested that he did not know that the Reichsbank was receiving articles of this kind. The Tribunal is of the opinion that Funk either knew what was being received or was deliberately closing his eyes to what was being done..."
Hjalmar Schacht - The financial wizard who helped Hitler re-arm Germany, but eventually fell out of favor and was arrested in 1944 with many others after the failed assassination attempt on Hitler and sent to a concentration camp. Found not guilty. Schacht went on to have a successful postwar business career in international banking and died in 1970. EXTRACT of the Judgment for Schacht as it was pronounced. "Schacht was an active supporter of the Nazi Party before its accession to power on January 30, 1933, and supported the appointment of Hitler to the post of Chancellor. After that he played an important role in the vigorous rearmament program which was adopted, using the facilities of the Reichsbank to the fullest extent in the German rearmament effort... As Minister of Economics and as Plenipotentiary General for War Economy he was active in organizing the German economy for war... But rearmament of itself is not criminal under the Charter. To be a crime against peace under Article 6 of the Charter it must be shown that Schacht carried out this rearmament as part of the Nazi plan to wage aggressive wars... The Tribunal has considered the whole of this evidence with great care, and comes to the conclusion that this necessary inference has not been established beyond a reasonable doubt." Karl Dönitz - Grand Admiral who became Commander in Chief of the German Navy in 1943 and at the end of the war was designated to succeed Hitler. Dönitz directed the Battle of the Atlantic against Allied shipping using the wolf pack technique of submarine warfare. Found guilty on counts 2 and 3. Sentenced to ten years imprisonment. EXTRACT of the Judgment against Dönitz as it was pronounced. "Although Dönitz built and trained the German U-boat arm, the evidence does not show he was privy to the conspiracy to wage aggressive wars or that he prepared and initiated such wars... The Tribunal is of the opinion that the evidence does not establish with the certainty required that Dönitz deliberately ordered the killing of shipwrecked survivors... The evidence further shows that the rescue provisions were not carried out and that the defendant ordered that they should not be carried out... Dönitz was also charged with responsibility for Hitler's Commando order of October 18,1942...[by which] the members of an Allied motor torpedo boat were...turned over to the SD and shot..."
Erich Raeder - Grand Admiral and Commander in chief of the German Navy until he was succeeded by Dönitz in 1943. Found guilty on counts 1, 2, and 3. Sentenced to life imprisonment but was released in 1955. EXTRACT of the Judgment against Raeder as it was pronounced. "In the 15 years he commanded it, Raeder built and directed the German Navy; he accepts full responsibility until retirement in 1943. He admits the navy violated the Versailles Treaty, insisting it was 'a matter of honor for every man' to do so... He was one of the 5 leaders present at the Hossbach Conference of November 5, 1937... The conception of the invasion of Norway first arose in the mind of Raeder and not that of Hitler... Raeder endeavored to dissuade Hitler from embarking upon the invasion of the USSR... But once the decision bad been made, he gave permission six days before the invasion of the Soviet Union to attack Russian submarines in the Baltic Sea... It is clear from this evidence that Raeder participated in the planning and waging of aggressive war..."
Baldur von Schirach - Hitler Youth leader of part American origin who helped lead millions of young Germans into Nazi fanaticism, he became Gauleiter of Vienna in 1940. At Nuremberg he denounced Hitler. Found guilty on count 4 and sentenced to twenty years imprisonment. EXTRACT of the Judgment against von Schirach as it was pronounced. "...Von Schirach used the Hitler Youth to educate German Youth 'in the spirit of National Socialism' and subjected them to an extensive program of Nazi propaganda... When von Schirach became Gauleiter of Vienna the deportation of the Jews had already begun... On September 15, 1942, von Schirach made a speech in which he defended his action in having driven 'tens of thousands upon tens of thousands of Jews into the Ghetto of the East' as 'contributing to European culture'... The Tribunal finds that von Schirach, while he did not originate the policy of deporting Jews from Vienna, participated in this deportation after he had become Gauleiter of Vienna. He knew that the best the Jews could hope for was a miserable existence in the Ghettos of the East. Bulletins describing the Jewish extermination were in his office..."
Fritz Sauckel - Headed the Nazi slave labor program and was responsible for the forced deportation of five million persons from occupied territories into Germany. Found guilty on counts 3 and 4. Sentenced to death by hanging. EXTRACT of the Judgment against Sauckel as it was pronounced. "...Shortly after Sauckel had taken office, he had the governing authorities in the various occupied territories issue decrees, establishing compulsory labor service in Germany... That real voluntary recruiting was the exception rather than the rule is shown by Sauckel's statement on March 1, 1944 that 'out of 5 million workers who arrived in Germany, not even 200,000 came voluntarily.' ...His attitude was thus expressed in a regulation: 'All the men must be fed, sheltered, and treated in such a way as to exploit them to the highest possible extent at the lowest conceivable degree of expenditure.' The evidence shows that Sauckel was in charge of a program which involved deportation for slave labor of more than 5 million human beings, many of, them under terrible conditions of cruelty and suffering." Alfred Jodl - Chief of the Operations Staff of the High Command of the German Armed Forces. At Nuremberg he claimed it was "not the task of a soldier to act as judge over his supreme commander." Found guilty on all 4 counts. Sentenced to death by hanging. EXTRACT of the Judgment against Jodl as it was pronounced. "...Jodl discussed the Norway invasion with Hitler, Keitel, and Raeder on December 12, 1939; his diary is replete with late entries on his activities in preparing this attack... He was active in the planning against Greece and Yugoslavia... Jodl testified that Hitler feared an attack by Russia and so attacked first. This preparation began almost a year before the invasion. Jodl told Warlimont as early as July 29, 1940 to prepare the plans since Hitler had decided to attack... A plan to eliminate Soviet commissars was in the directive for 'Case Barbarossa.' The decision whether they should be killed without trial was to be made by an officer... His defense, in brief, is the doctrine of 'superior orders,' prohibited by Article 8 of the Charter as a defense... Participation in such crimes as these has never been required of any soldier and be cannot now shield himself behind a mythical requirement of soldierly obedience at all costs as his excuse for commission of these crimes." Franz von Papen - Chancellor of Germany in 1932 who aided Hitler and the Nazi takeover of power in 1933 and was involved in the Nazi Anschluss (union) with Austria in 1938. Found not guilty. EXTRACT of the Judgment for von Papen as it was pronounced. "Von Papen was active in 1932 and 1933 in helping Hitler to form the Coalition Cabinet and aided in his appointment as Chancellor on January 30, 1933. As Vice-Chancellor in that Cabinet be participated in the Nazi consolidation of control in 1933... Notwithstanding the murder of his associates, von Papen accepted the position of Minister to Austria on July 26, 1934, the day after Dollfuss had been assassinated... The evidence leaves no doubt that von Papen's primary purpose as Minister to Austria was to undermine the Schhuschnigg regime and strengthen the Austrian Nazis for the purpose of bringing about the Anschluss. To carry through this plan he engaged in both intrigue and bullying. But the Charter does not make criminal such offenses against political morality, however bad these may be... Under the Charter, von Papen can be held guilty only if he was party to the planning of aggressive war...but it is not established beyond a reasonable doubt that this was the purpose of his activity..."
Arthur Seyss-Inquart - Gauleiter of Austria and then Reich Commissioner of the Netherlands, and the man who betrayed Austria to the Nazis during the Anschluss. Found guilty on counts 2, 3, and 4. Sentenced to death by hanging. EXTRACT of the Judgment against Seyss-Inquart as it was pronounced. "...Seyss-Inquart participated in the last stages of the Nazi intrigue which preceded the German occupation of Austria... As Reich Commissioner for Occupied Netherlands, Seyss-Inquart was ruthless in applying terrorism to suppress all opposition to the German occupation, a program which he described as 'annihilating' his opponents. In collaboration with the Higher SS and Police leaders he was involved in the shooting of hostages for offenses against the occupation authorities and sending to concentration camps all suspected opponents of occupation policies including priests and educators... Seyss-Inquart contends that he was not responsible for many of the crimes committed in the occupation of the Netherlands... But the fact remains that Seyss-Inquart was a knowing and voluntary participant in War Crimes and Crimes against Humanity which were committed in the occupation of the Netherlands." Albert Speer - Architect, close friend of Hitler, and Minister of Armaments and War Production from 1942 to 1945, Speer coordinated the entire German industrial war production effort. At Nuremberg, Speer acknowledged the guilt of the Nazi regime and admitted responsibility for the slave labor in factories under his control. Found guilty on counts 3 and 4. Sentenced to twenty years. On his release from Spandau prison in 1966, Speer became a best selling author with his book, Inside the Third Reich. He died in 1981, and maintained until the end he had known little about the extermination of the Jews. EXTRACT of the Judgment against Speer as it was pronounced. "The evidence introduced against Speer under counts 3 and 4 relates entirely to his participation in the slave labor program... As Reich Minister for Armaments and Munitions and General Plenipotentiary for Armaments under the Four Year Plan, Speer had extensive authority over production... The practice was developed under which Speer transmitted to Sauckel an estimate of the total number of workers needed, Sauckel obtained the labor and allocated it to the various industries in accordance with instructions supplied by Speer. Speer knew when he made his demands on Sauckel that they would be supplied by foreign laborers serving under compulsion... Sauckel continually informed Speer and his representative that foreign laborers were being obtained by force... (However) It must be recognized that...in the closing stages of the war he was one of the few men who had the courage to tell Hitler that the war was lost and to take steps to prevent the senseless destruction of production facilities..."
Konstantin von Neurath - Nazi Foreign Minister from 1932 to 1938, then Reich Protector of Bohemia and Moravia, responsible for the Nazi crackdown on Czechoslovakia after the German invasion. Found guilty on all 4 counts. Sentenced to fifteen years imprisonment, but was released after eight years in 1954 for health reasons. EXTRACT of the Judgment against von Neurath as it was pronounced. "...As Minister of Foreign Affairs, von Neurath advised Hitler in connection with the withdrawal from the Disarmament Conference and the League of Nations on October 14, 1933, the institution of rearmament... Von Neurath took part in the Hossbach Conference of November 5, 1937. He has testified that he was so shocked by Hitler's statements that he had a heart attack. Shortly thereafter he offered to resign, and his resignation was accepted on February 4, 1938, at the same time that von Fritsch and von Blomberg were dismissed. Yet with knowledge of Hitler's aggressive plans he retained a formal relationship with the Nazi regime as Reich Minister Without Portfolio... Von Neurath was appointed Reich Protector for Bohemia and Moravia on March 18, 1939... The free press, political parties, and trade unions were abolished. All groups which might serve as opposition were outlawed... He served as the chief German official in the Protectorate when the administration of this territory played an important role in the wars of aggression which Germany was waging in the East, knowing that War Crimes and Crimes Against Humanity were being committed under his authority..."
Hans Fritzsche - Responsible for controlling the German Press, then head of Radio Broadcasting in the Nazi Ministry of Propaganda under Joseph Goebbels. Notable for a voice that sounded like Goebbels on the radio, Fritzsche broadcast Nazi political commentary. Found not guilty. EXTRACT of the Judgment for Fritzsche as it was pronounced. "...The Radio Division, of which Fritzsche became the head in November 1942, was one of the twelve divisions of the Propaganda Ministry . . . It appears that Fritzscbe sometimes made strong statements of a propagandistic nature in his broadcasts. But the Tribunal is not prepared to hold that they were intended to incite the German people to commit atrocities on conquered peoples, and he cannot be said to have been a participant in the crimes charged..."
On October 16, 1946, Ribbentrop was the first one taken into the execution chamber of the Nuremberg prison and mounted the gallows to be hanged. He was followed in quick succession by Keitel, Kaltenbrunner, Rosenberg, Frank, Frick, Streicher, Seyss-Inquart, Sauckel, and Jodl. The bodies were then taken to the crematorium at Dachau concentration camp and burned. The ashes were scattered into a brook in Munich.